An astrologer's first step in prediction consists of analyzing the patterns of an individual's horoscope. This analysis is then brought up to the present and projected into the future so that the astrologer can give the invididual practical and relevant advice. 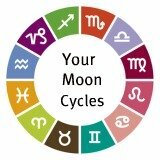 The individual's changing circumstances, periods of restriction or of opportunity, and periods of change and stability are assessed by the astrologer. This type of general prediction is usually referred to as the analysis of future trends. The birth horoscope represents the basic psychological pattern with which an individuals life begins. This birth horoscope gives the positions of the planets at the exact time and place of an individual's birth. As the individual matures, the planets change their positions in the Zodiac and therefore move into new relationships to each other and to their positions in the birth horoscope. The relationships of the movements of the planets in the heavnes to the planets in the birth horoscope are called transits. Transits are, by definition, the aspects formed between the positions of the planets in the heavens, at any given time, in relationship to the positions of those planets in the birth horoscope. Aspects, transiting or in the birth horoscope chart, are the specific angular relationships that exist between planets in the heavens at any given time. Transits are signposts that show the way forward into the future, but can only be read in relation to the birth horoscope chart. These transits act as a 'release' or 'trigger' to the potential of the birthchart. Astrologers generally forecast tendencies rather than specific event except when the indications are especially strong. Major events may also be predicted. It is usually a fairly simple matter to pinpoint career or major partnership changes and domestic moves together with the approximate date or dates, when these are likely to occur. The slower a planet moves the longer lasting the event is signifies. Faster moving planets have less profound significance. However, major events usually happen when slow and fast moving transits are simultaneously strong. The transits of the slower-moving planets (Jupiter, Saturn, Uranus, Neptune and Pluto) indicated long-range trends which can be of major significance. The faster moving planets (Sun,Moon,Mercury, Venus and Mars) indicated day to day changes in mood and attitude. They act as timing factors in determining the significant events indicated by the slower moving planets.